An emerging body of analytic work has demonstrated the linkage between poverty, armed conflict, and weak state governance. States which exemplify this nexus of human vulnerability and state failure are often referred to as ‘fragile states’-- those failing, whether for lack of capacity or political will, to perform core functions of delivering basic services and protecting the security of its citizens. 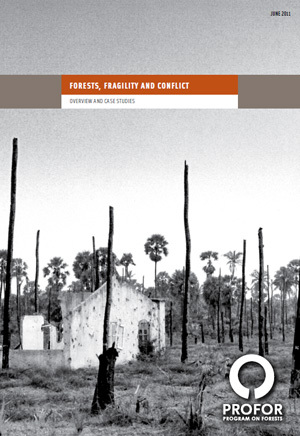 There are strong correlations between state fragility, conflict, and the means by which natural resources such as forests are managed by the state. When resource rents and concession allocations are used for patronage it has the perverse effect of not only undermining the sustainable use of forest assets for development and access to forests for local livelihoods, but it also short-circuits state accountability to citizens and the development of sound governance institutions, laying the foundations for state fragility and conflict. The causal pathways between forests, weakened governance and violence are, however, poorly understood. For example, the dependence on forest income (as a proportion of GDP) has been demonstrated to be a poor predictor of violent conflict. Likewise, the proportion of national land area under forest cover is a poor predictor of state fragility. Indeed, there is no correlation between the likelihood of a country becoming a failed state and the extent of its forest area. Having said this, nearly three quarters of the world’s forests are found in countries which have been assessed to be either failed states or are at moderate risk of becoming failed states. the characteristics of fragile states that should be the focus of reform in post-conflict interventions in order to improve protection of forests and forest-based livelihoods and to mitigate further conflict. The synthesis report informed some of the thinking that went into the World Development Report on Conflict, Security and Development, available here. The synthesis and case studies, published as a collection in June 2011, are available on this page. The hope is that this publication will contribute to the articulation of a strategic approach to dealing with forest management in post-conflict operations.